Izdavac je tvrtka MedVid produkcija iz Pule u nakladi od 1000 komada. Cijena je 20 USD. 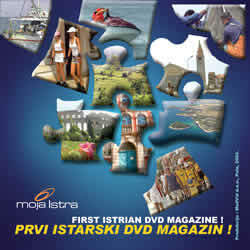 "My Istria" is the first magazine in DVD video format intended for the Istria emigrants settled all over the world. It is about a completely new product, a revolutionary way of communication between Istria and the emigrants - it is an electronic monthly newspaper. From now on and throughout the numerous columns such as news, sport, culture, cuisine, youth, amusement, etc., all the emigrants from all over the world will have an opportunity to learn about the latest events in their homeland as well as to be educated about the history and tradition of Istria. On the other hand, the second and the third generations will have an opportunity to learn language and customs. "My Istria" is "a small professional TV of Istria" in the emigrants' homes. Passing throughout the stories, reportages, interviews and interesting items in a potable video-audio combination lasting about two hours, Istria will no more be far away for anybody. It is especially interesting that the complete product will be translated into English language, so all those who have problems with understanding Croatian language will be able to follow the program. Through these pages, "My Istria" is accessible for anybody in the world, so it is possible to order own copy of the DVD through our link. The rest of the news from Istria will be involved in a form of specially created video pages.